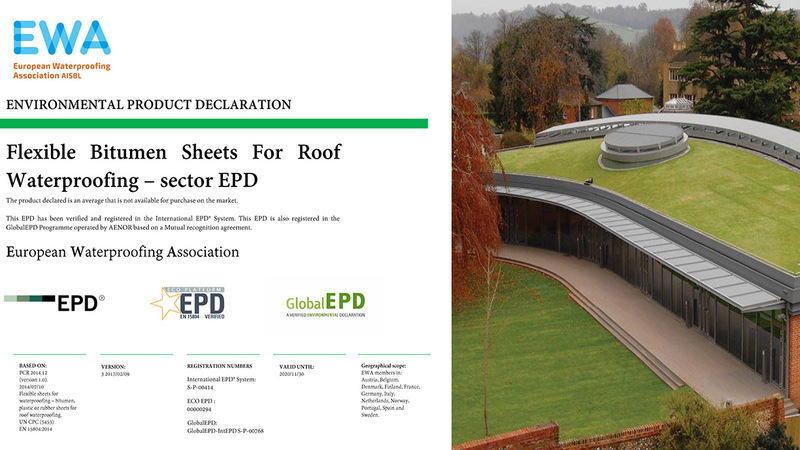 EWA has registered an Environmental Product Declaration (EPD) with information on the average environmental impact from bitumen waterproofing membranes produced by 42 plants in Austria, Belgium, Denmark, Finland, France, Germany, Italy, Netherlands, Norway, Spain, Sweden and Portugal for Bitumen Roof Waterproofing Systems as an ECO Platform EPD with ECO EPD Reference number 00000294. By introducing standardised environmental product declarations, EWA supplies its members and their customers with transparent and comparable environmental data. The EPDs help users of bitumen waterproofing membranes in their investment decisions and in the sustainable design of their value-added chain. In an environmental product declaration, data from life cycle assessments are prepared, and statements about environmental impacts are made. These data can be compared with other EPDs of the same product category. There are several EPD initiatives with different Program Operators according to ISO 14025. EWA has decided in favour of the International EPD System because it is certified ISO 14025, it prescribes serious external verification of the information in the EPD by third parties and represents the most credible international independent system. The International EPD System is a founding member of the ECO Platform and its procedures has undergone a peer audit to be able to use this logotype. The EWA EPD has been dually-registered under the scope of the three mutual recognition agreements between the International EPD® System and IBU, AENOR GlobalEPD and EPD Norway, respectively. The EPD thus has the right to bear the logotypes of the International EPD System and each other programme, respectively. Click here to access the EWA EPD via Environdec (external link). Click here to access the EWA EPD via IBU (external link). EWA Sector EPD Lightweight underlays for roof waterproofing via Environdec ​ (external link).